As the Happy Helpers from Mickey and the Roadster Racers, BFFs Minnie and Daisy take center stage as they tackle super-tough tasks and help friends who need a hand: judging a surfing contest in Hawaii, solving a doozy of a mystery, photographing a rare rainforest bird and much more! Then, watch Minnie rock out onstage at Hot Dog Hills Stadium! 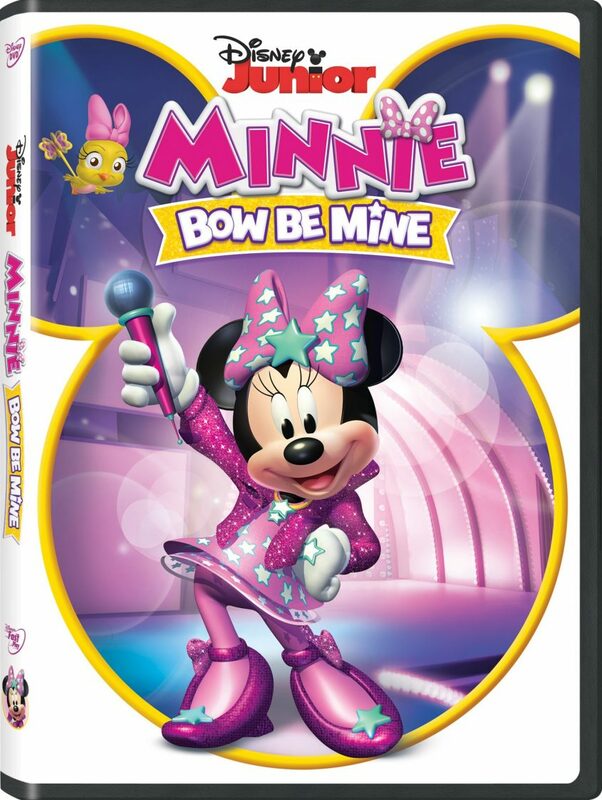 Featuring two bonus music videos, Bow Be Mine amps up the fun to a whole new level of awesome. Russi Taylor as Minnie Mouse; Tress MacNeille as Daisy Duck; Bret Iwan as Mickey Mouse; Daniel Ross as Donald Duck; Bill Farmer as Goofy; Jim Cummings as Pete; and Jay Leno as Billy Beagle. Be sure to check out the Valentine’s Day Minnie Ears Craft below! Get the DVD on Amazon!